In a job market as competitive as ours, it’s important to have a strong resume. Whether you’re a long-standing veteran in your field, or still wet behind the ears, if your document is unsightly or poorly organized, you’re going to have a hard time landing interviews for the jobs you want. Your resume should be more than just a list of your skills and previous jobs. is a surefire way to improve the quality of your document and better attract the attention of hiring managers. 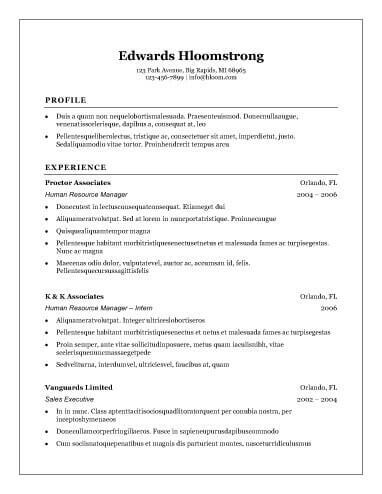 Our templates are great examples of strong resumes and will help you better understand how to properly format your document, as well as what information to include. 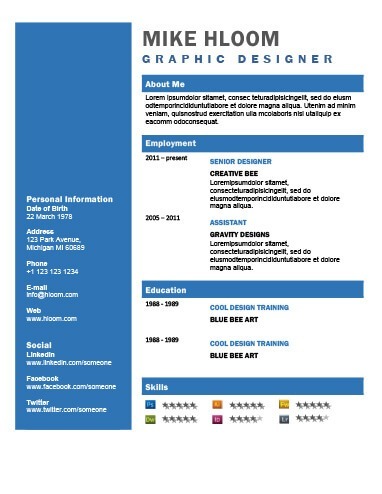 Why Use Server Resume Templates? You may scoff, but your work experience alone does not a resume make. Perhaps it may have been sufficient in the past, but according to a recent study, hiring managers take no more than six seconds to peruse your resume before deciding whether to keep reading or move on to the next one. This means your window of opportunity is extremely short, so your document must demand their attention from the first second they look at it. Taking advantage of the server resume templates we’ve provided as well as the writing guide and tips will ensure yours stands out from the competition for all the right reasons. If choosing a format is difficult for you, feel free to choose from our most popular server resume templates. This library of options features tried and true formulas that have helped many jobseekers land the jobs they’re looking for. They are also suitable for multiple career stages and experience levels, so you needn’t worry about them being compatible with your current situation. If you’ve never waited tables before but need something that pays a little more than your retail job, you don’t have to worry about having the right information on your resume. Entry-level server resume templates take advantage of extra white space and focus on transferable skills rather than explicit work history. We also have tips for jobseekers at the entry level to help land the job you’re looking for. According to the Bureau of Labor Statistics, server positions should increase by 7% by 2026, which is roughly average for all professions. Though the prospects are good, this by no means suggests it will be easier to land server positions, since the number of available jobs will invariably mean increased competition. Use our contemporary server resume templates to keep ahead of the curve. Since waiting tables is a common profession, a classic server resume template is often appropriate. This format does a great job of arranging your information in a visually pleasing way without being too flashy. They’re also easy to make, which is perfect if you’re applying for a server position at multiple restaurants and need to tweak and customize your document. Unless you’re applying for an executive position with a large corporation, it’s generally considered a good practice to keep your resume to one page. Use these templates to ensure you organize your skills, qualifications, and work history information well and that they fit neatly onto a single page. Include your full name, phone number, and email address prominently so hiring managers can easily locate them. If your LinkedIn profile is strong, including a link to your page here is a great way to go above and beyond and impress hiring managers. Your mailing address isn’t required, but can be helpful in some cases. Avoid dated email providers like AOL or Hotmail, and ensure your email address is professional and uses your name. If necessary, create a new email address. Clearly communicate the position you’re seeking and your ability to perform the required duties. Demonstrate to hiring managers why you’re the best person to fill the position. Including keywords from the restaurant’s job description is quite effective in this section. Use four to six bullets that quickly but thoroughly communicate your relevant skill set. Familiarize yourself with the culture and language of the business, and use it in this section. Also, use keywords and phrases from the restaurant’s job listing. Don’t make the mistake of including every position you’ve had in the last few years. If a position or experience is not directly relevant to your ability to wait tables effectively, it’s pointless to include it. Include dates, company names, and job titles. Use three to five bullets per position to describe your duties. Don’t leave out certifications, seminars, or continuing education courses. Include the date of graduation, field of study, and institution name. * No technical knowledge required. Thanks to a user-friendly, intuitive interface, resume builders are accessible by even the most computer illiterate. * Easy to customize resumes. The basic format makes tweaking and altering your document for individual companies a breeze. * Automatic proofreading. Everyone makes mistakes. A resume builder automatically fixes any typos in your document before you send it off to potential employers.